"Theresa goes above and beyond with each and every project. As a Realtor, I feel very confident in Theresa's ability to transform a home from the furnishings to accessories. Each time my clients had their listings staged with Stage Right, the home went under contact within a week or less!! I highly recommend Stage Right if you are looking to sell a home fast for the most amount of money! " "Thank you for staging our home BEAUTIFULLY, Theresa!! You came through for us in a last minute pinch and our house SOLD in less then two weeks!! She have fantastic referrals that will save you money and headaches! 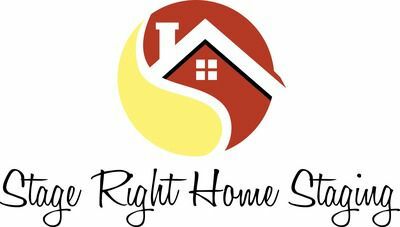 I highly recommend Stage Right Home Staging because you will sell your house quickly. Thank you and all the best." "Stage Right Hone staging did a great job at staging my home! She had great ideas! The staging definitely helped sell my home after being on the market for 6 months! I would definitely recommend this service for anyone selling their home! " "Stage Right turned our empty house into a cozy home. We had multiple offers including a full price offer on our flip within the first 6 days. The results speak for themselves. Theresa and her staff exceeded our expectations and made our finished rehab look wonderful! We will certainly use Stage Right on our next flip. " I use Stage Right in all of my homes that I renovate for resale and they really do a great job. The last two sold in 1 day with multiple offers. I used Stage Right! Home Staging, LLC for a listing I inherited that sat vacant for almost 3 years. We staged the property, listed it on the market, and sold it within a few months. Stage Right! Home Staging did a great job transforming the "space" into a "home". It was this artistry that allowed the buyer to see the potential of this fabulous home and purchase it. Thank you Stage Right! I will definitely recommend you again! Stage Right was the solution for getting my dads home sold in Bear, Delaware under very difficult circumstances. I would recommend their services to anyone who must sell a home! Living in texas, being an absent owner, and having initial troubles with a real estate company all led to our house being up for sale for several months without any prospects. Our new real estate agent recommended Sate Right! Home Staging to us. I'll admit I was skeptical and at first hesitated due to the cost. But after deciding to go ahead with the staging, I was amazed to see the home sell to one of the first prospective homebuyers to walk through. Stage Right! did a great job of making our home look and feel like a home you could see yourself living in. Thanks Stage Right! We called Stage Right after we thought we cleaned the house up for selling but prior to listing the house for sale. Thank goodness we did because what we did not know was sure to hurt us. When you live in a house you stop seeing certain things that are an eye sore to others. Every room looks so much bigger and brighter. Sometimes cleaning just is not enough. The things we were told to change now seem common sense and we wonder why we did not think of that. Most of the things we were told to change took no money at all to do, just rearranging and getting rid of stuff. If you spend money on a cleaning service or lawn service why wouldn't you invest in your property to stage it and get it sold? Your ROI will more than pay for itself. Incredible experience with Stage Right helping us sell our home in a slow real estate market. We're convinced that it helped immeasurably to move it in a down market. Ten years in the home and many accumulated possessions had to be tastefully removed and screened! What a difference it made! Follow all suggestions and it works!Prospective buyers can visualize their family furniture and decoration ideas in a minimalized atmosphere much better than a cluttered one.I would recommend Stage Right to anyone who is serious about selling their home! I have been dreading selling my house for the simple fact that as everyone knows, in order to get top dollar in this market, your house has to look better then every other house at the same price. I just did not have the time to devote, which is where Stage Right came in. They gave me a reasonable price after they went through the work was to be done. Then they scheduled a time, came in and made it happen. The house looks better now then it did when I lived in it. The whole process was easier then I thought it would be. I just listed the house and all the comments from buyers to agents are the same, “it looks the best for homes in its price range on the market". I believe I will get an offer much sooner then homes that are not staged. In fact, there are more then a few buyers looking seriously at my home right now! If you are selling your property, do yourself a favor and have the pro’s at Stage Right Home Staging do the work for you and get it staged. Theresa brings great qualities to her presentation. I had the opportunity to see Theresa as she performed magic at the property where we met. The home was nice but she made it sparkle. My 20+ year history as a Realtor, Broker & Appraiser have taught me to look past some of the normal things that one expects to see. Within minutes Theresa was showing me potential that I couldn't imagine. Theresa balances the business of her work with common sense & uncommon awareness of the mission. My clients are also as impressed. Her contributions made more progress than any of us dared to expect. Her services & customized approach allows for any budget & awesome results. I will seek her advice again. Without hesitation, I will suggest her name & skills for the benefit of future clients. How can one quantify the positive influence & overall benefit of the important "First Impression" when shopping for a home? Not enough superlatives? I am available for further comment. I thought my house was beautifully decorated and not very cluttered untilTheresa came over and worked her magic. I recommend that anyone interested in getting the most out of the sale of their home call Stage Right!Not only is Theresa talented but everytime I had a question, I was able to call her or e-mail her and she always answered the phone or e-mailed me back. The house we were looking fell through and we never moved, but I still have my house staged and am loving it.